Something under half the pieces here are generalized restatements of the uses of semiology--"Sociology and Socio-logic," "Semiology and Urbanism," "Senfiology and Medicine"--that were originally addresses or contributions to omnibus volumes. More interesting are the notes for the seminar Barthes gave at the Ecole practique des hautes etudes in 1964-65: an "aide-memoire" on the classifications of ancient rhetoric, clearly with the aim of recalling the fact that language classification, including that of the signifier/signified, was not unknown centuries before and that semiology simply continues an otherwise lost tradition. Equally as interesting (and scholarly) is Barthes' "Introduction to the Structural Analysis of Narratives": a chapbook-sized guide to structuralist thinking in regard to story, which Barthes at the end of the book actually puts into play with structural analyses of a Poe tale and verses from Acts and Genesis. 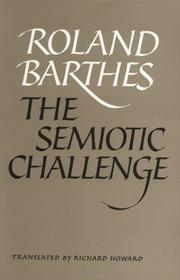 Reading Barthes the scholar rather than the social critic (though he's freewheelingly campy in both: blasÃ‰ about sources, using lan Fleming's Goldfinger as an exemplary text at one point) is refreshing, and the book--though not for many outside the academy, probably--earns its distinction as such.